Once you have files uploaded to one or more Collections and you have created a Campaign, you can begin dispatching the files to Assessors to generate the assessments. 2. 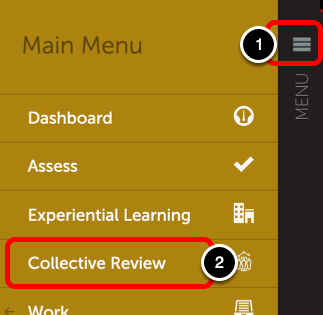 Select on Collective Review. 3. Select the Campaigns tab. 4. Locate the desired Campaign and click the menu. 5. Select Dispatch from the menu. If you selected the Assessor Pool distribution option for your Campaign, follow these steps to dispatch your files. Randomly assign files by number: allows you to identify the number of files (e.g. 100) you would like the system to randomly dispatch from the selected Collection(s) to the assessors. Randomly assign files by percentage: allows you to identify the percentage of files (e.g. 50%) you would like the system to randomly dispatch from the selected Collection(s) to the assessors. Manually select the files: allows you to manually select each file that you wish to dispatch to the assessors from your Collection(s). 2. Select the Collection(s) from which you would like the files to be selected for dispatch. You can choose as many Collections to draw from as desired. 3. Enter the number or percentage of files that you would like the system to randomly dispatch from the selected Collection(s) to the assessors. This option is not available if you selected the "Manually select files" option above. 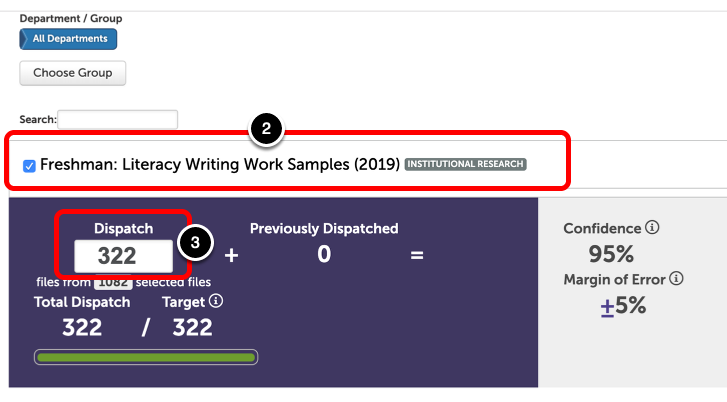 Target: The Target number indicates how many files should ideally be selected from the Collection(s) in order to ensure that your sample size (number of assessments generated) will be statistically significant, based on your population size (number of people in the group being studied). Confidence Level: Probability that your sample assessments accurately reflect those of your population. The industry standard is 95%. Margin of Error: The range that your population's assessments may deviate from those of your samples. 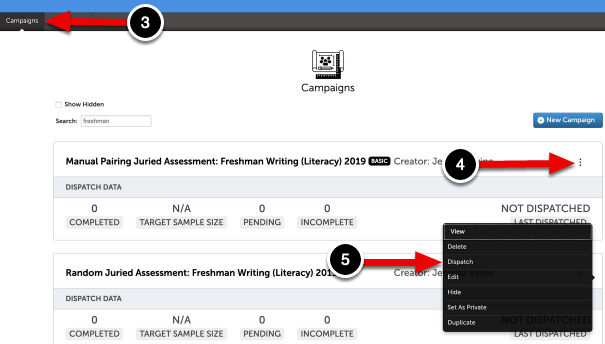 If you selected the Basic distribution option for your Campaign, follow these steps to dispatch your files. 1. Select your delimiter (use "tab" if copying and pasting from Excel). 2. Select which piece of information is listed in the first column (Assessor or File Name). 3. 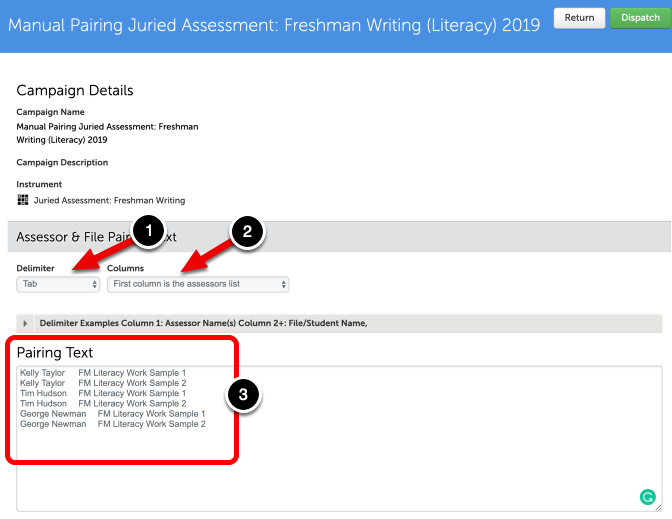 Paste your paired list of Assessors and File Names into the text box. When identifying your Assessors, you can use either their name, email address, or login name. The latter two are more reliable as names are not always unique. Click Dispatch to send the files to the Assessors and generate the assessments.